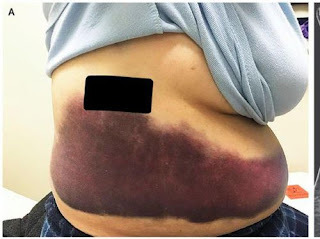 The waist area of ​​the woman is bruised because of her broken ribs. Whooping cough or pertussis is an infectious disease caused by Bordetella pertussis bacteria. An infected person may experience symptoms of a severe cough up to several months. Well related to this a 66-year-old woman reported in The New England Journal of Medicine experienced the unexpected effects of pertussis that is broken ribs. The reason is because he coughs very hard. Quoted from Live Science, the woman initially came to a general practitioner with a cough for two weeks and pain in the chest. When examined clearly visible bruises along his right waist. X-rays showed the cause was because the woman's ribs were broken. The doctor took a sample of mucus in the nose and throat where it was confirmed that he was infected by pertussis. In the end the woman had surgery to correct her broken ribs. He also received antibiotics to prevent pertussis bacteria from disappearing from the respiratory tract. In a report doctors call that pertussis can be fatal for children and can cause complications in adults. The United States Agency for Disease Control (CDC) says that indeed about four percent of adults infected with pertussis may experience rib fractures because of coughing too hard. One of the most effective ways to prevent getting infected with pertussis is by vaccines. The CDC recommends repeating vaccinations every 10 years for maximum protective effect. 0 Response to "This woman is very cough until her ribs are broken"